The Buckley War Memorial in the Garden of Remembrance at Hawkesbury commemorates those who fell in two world wars. The Memorial was dedicated on 9th September 1951. The Right Hon. Lord Kenyon unveiled the Cenotaph, and the Service of Dedication was conducted by the Lord Bishop of St. Asaph. The Salute was taken by Brig. H.S.K. Mainwaring, Lord Lieut. of Flintshire. The Band of the 4th Btn. The Royal Welch Fusiliers was in attendance. 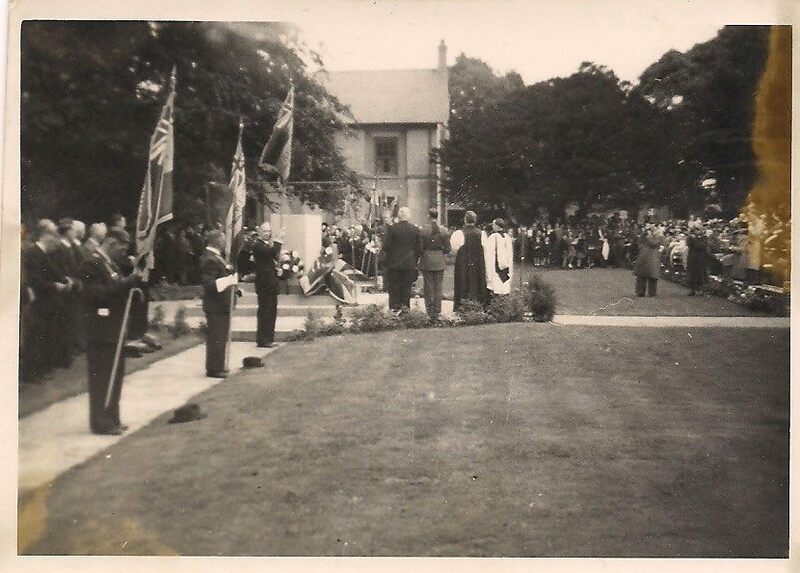 The British Legion collected money from the community for the memorial after WW2. 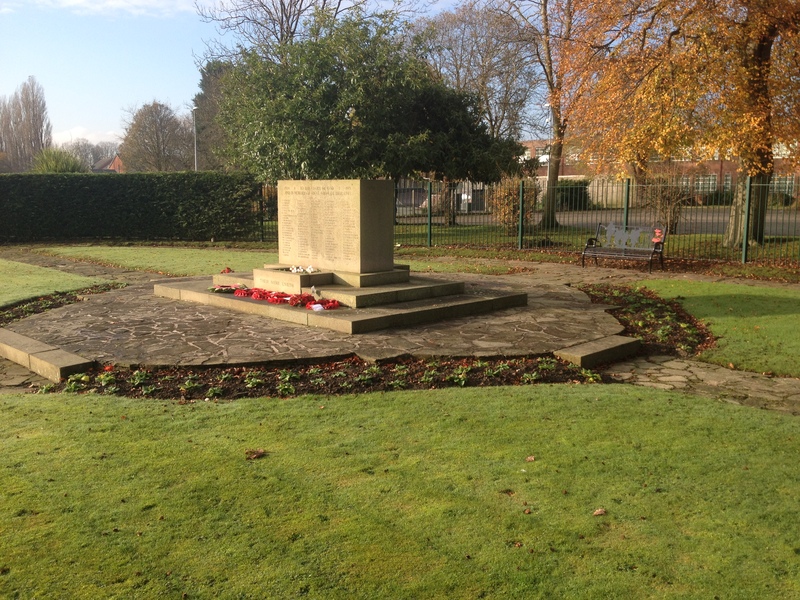 The Memorial commemorates 114 Buckley men who fell in WW1. Most of the names correspond to names placed on memorial plaques in St. Matthews and Bistre churches in the early 1920s. At this time this website includes information for the 114 men named on the Memorial. The total from the district who died was probably 140 or more and additional biographies will be added in the future. In line with national statistics for British forces, about one in nine who served in the war would die. Many more were injured but their sacrifice is much less well documented than for those died. The locations where soldiers died remind us that this was truly a world war. Two Buckley men, Henry Thomas Asbury and Charles Davies died in Russia. At least 20 died in the Middle East, in Egypt, Mesopotamia and Palestine, and 4 died at Gallipoli. Of course, most losses were on the Western Front, and the great memorials in France and Belgium bear many Buckley names; 10 and 7 respectively on the Menin Gate and Tyne Cot Memorials at Ypres, 7 at Thiepval on the Somme, and 5 at Arras. The first Buckley soldier known to have died was William Stanley Roberts on November 16, 1914 at Ypres. From then until the Armistice and beyond a Buckley man died on average once every 10 days, but some months coinciding with major offensives were more deadly than others. In August and September 1915, nine died at Gallipoli and Loos. 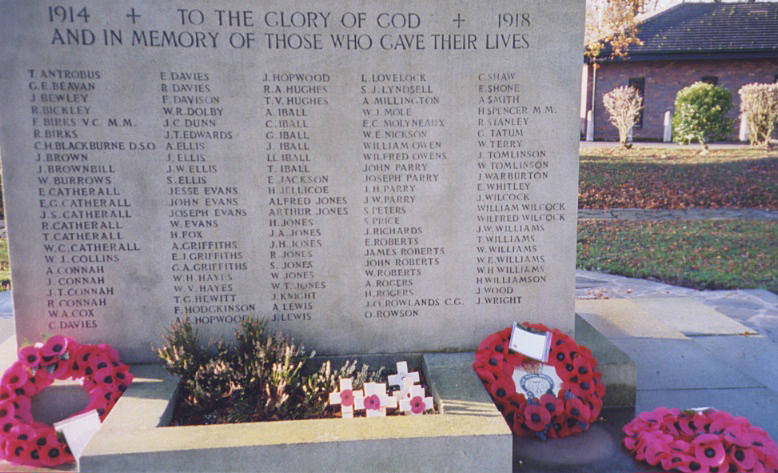 Four men died on 25 September 1915, three with the Royal Welch Fusiliers at Loos. In July and August 1916, 17 died mostly on the Somme. Five died in March 1917 in Palestine, four on one day, 26 March. From June to November 1917, 26 died, mostly at Ypres. The deadliest period of all was in the last months of the war when 26 died between August and November 1918 (including 12 in October), mostly on the Western Front. More than half of those who died served in the Royal Welch Fusiliers, but in all about 30 regiments are represented. Only a handful were officers, but many won medals for gallantry, including a Victoria Cross (Fred Birks, awarded posthumously at the Third Battle of Ypres in 1917); at least 12 Military Medals, including Albert Spencer killed on the Somme in 1918; a Croix de Guerre (Oliver Rowlands, killed in France in 1918); and a Distinguished Service Order (Charles Blackburne drowned on the Leinster in 1918). In an age of large families, there were many instances of brothers serving, and inevitably several cases of brothers being lost. Thomas and Elizabeth Ellis of Mold Rd had 4 sons serving and lost two, Arthur and John. Thomas and Mary Emma Jones of Brunswick Rd. lost two sons, Arthur and Herbert Jones, killed five weeks apart in 1917. Gordon and Percy Messham were sons of Edward and Mary Ellen Messham of Dobshill. Percy and a cousin, Edgar Messham were killed 8 days apart at Ypres in 1916 and are buried in the same cemetery. In terms of numbers, no sacrifice matched that of the Connah family of Spon Green. Benjamin and Margaret Connah gave 7 sons to the Colours and three were killed, Alexander, John and James. Another brother lost a leg and another was severely wounded. Considering an extended family, the name Iball appears six times on the Hawkesbury Memorial (Albert, Charles, George, Llewellyn, I. J., and Thomas), plus James is on the Bistre Memorial. Charles, George, and James were brothers, sons of Peter and Martha, living in Doncaster but born in Buckley. Iball is a uniquely Buckley name; in 1881, every one of the 71 people with the Iball name in England, Wales and Scotland lived in Buckley. In statistical terms the number of Iball men who died was about five times greater than would be predicted based on population. Not to be ignored, the Hawkesbury Memorial bears the names of Albert Iball and William Harold Iball killed in WW2. The number of children who lost fathers cannot be known, but some cases were recorded in the County Herald: John Warburton of Mold Rd. left a wife (Maria) and 7 children, the eldest 14; William James Collins of Brunswick Rd. of Ewloe Place a widow and 5 children; Leonard Lovelock of Ewloe Place a widow and 3 children; Edward Shone of Park Rd. a widow and 2 children; A. Davies of Nant Mawr a wife and 6 children, the oldest 13; Percy Messham of Drury a widow and 4 children; Joseph Parry of Aberdovey Terrace a wife and 5 children. Buckley at the time of WW1 was much smaller than today and much more noticeably a number of separate neighbourhoods. The impact that must have been felt by small communities is illustrated by the following approximate numbers: Mold Rd. (from the Cross to Pren y Brigog) 18 died; Brunswick Rd. 15; Lane End and Spon Green 13; Ewloe Place, Common and Liverpool Road 11; Mynydd Isa 6; Nant Mawr 6; Drury and Burntwood 5; Church Rd. 4; Alltami 4; Mill Lane 3.. The story of Fred Birks is well known and has been covered in several previous articles in the Buckley Magazine. Fred was not the only Buckley native who emigrated and later returned to Europe to fight. Other emigrants who were killed included Reuben Stanley (Canada), John Wilcock (Canada), Amos Smith (Australia), and Reginald Arthur Hughes (Canada). Many Buckley soldiers from both world wars are commemorated on the Buckley at War website. Research is an ongoing activity and additional information submitted via the contact link at the top of the page is always welcome.